Vibhu frustrated on tiwari and Angooris behaviour, Saxena asks him what’s wrong with him, vibhu says my leg os sprained and im frustrated please leave, Saxena says show me your leg and all will be fine, vibhu shows him leg, Saxena twists it, vibhu shouts in pain and then realises his leg is fine and thanks saxena. Angoori tells tiwari that she is not liking hurting Vibhu,tiwari says okay call him we will apologise. Angoori calls him and apologises, and says i would like to say sorry, please come here,for me,vibhu says okay i will be there for dinner. Malkan crying says this vibhu is doing too much,he beat me too, tilu asks why is he doing so, no respect for us, tilu says we were helping a girl but were accused of kissing and got beaten, now we will talk to him,vibhu has to apologise and if he doesn’t he will have to face us. Vibhu excited going to tiwari house, boys walk to him,he hugs them, teeka says we are here to say, vibhu says later,we will go to a place and you guys will love it, we are going to dance bar to see Rajo and Khajo dance. vibhu leaves, boys go to get dressed. Vibhu joins them for dinner, Angoori says i made noodles, vibhu says smelling so good but you two arent having wheres your fork, Tiwari says we dont eat with fork, Vibhu laughs and says then with hands, tiwari says angoori lets show him. both share one noodle and kiss. Tiwari says lets have some more. Vibhi feels disgusted, and says i will make move,tiwari says we have rice too, vibhu says oh god and leaves. boys dressed,wait for vibhu, Vibhu walks to them, and slaps them, tilu asks why now,vibhu starts beating them. Angoori crying, tiwari walks to her and asks whats wrong, Angoori says bhuri called and she heard about what we are doing, and she got upset, and is angry. tiwari says ask her not to tell daddy, Angoori says i did but if we continue someday they will learn. Angoori gets call from amaji, Tiwari starts yelling,amaji says shut up hear me first,now you two can stop it,pandit rampal actually saw my kundali,its me who should have done, angoori says thank you. vibhu having drinks, boys walk to him, with sticks, and start hitting him,vibhu stops them and asks whats wrong, boys say wrong is with you, tiwari walks to them and stop them from hitting vibhu, tiwari and angoori apologies and tell why they were behaving this way, Vibhu says what, everyone sees amaji and pandit rampal in pelus auto, getting romatic.vibhu asks for whoes benefits are they doing this. pre cap: Tilu says to Tiwari Agarwal has sent payment. Saxena makes fake call and says theres bomb in the bag in your hand. 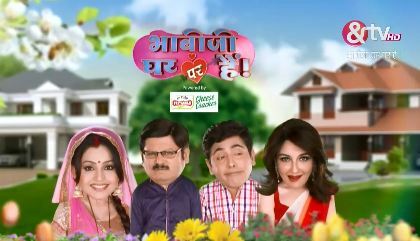 The post Bhabhi Ji Ghar Par Hai 28th February 2019 Written Episode Update Vibhuti keeps harassing boys. appeared first on Telly Updates.